For people of a meditative disposition the lava lamp is a vital piece of furniture. 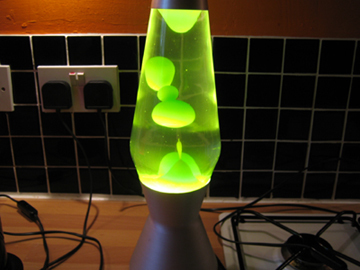 Useful as a focal point, to soothe, enhance and generally make your environment more relaxed and maybe a bit groovy. 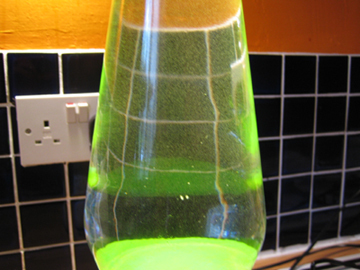 However, after time or if some fool picks it up and shakes it, a lava lamp can become cloudy which pretty much renders it useless. You turn it on and all the action is hidden behind a mist. Now, as part of a Molten Meditation project I'm creating a meditation event where a group of people get together and meditate to the music. 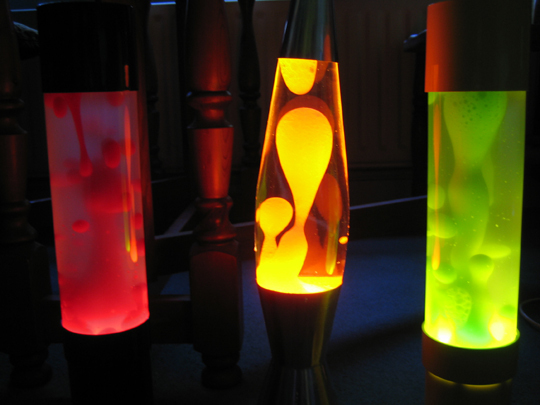 To create the right environment I want to use as many lava lamps as I can lay my hands on. As if ordained by the hand of God I stumbled upon a job lot of eleven on ebay in various states of repair and for a real bargain price. Of the eleven, eight were complete and working and of those, four were cloudy. For the price I paid just one working lamp would have still been a bargain! There was lot's of talk about long term cycles where you turn it on for six hours and then leave it off for two hours - continuously for months and also some people had success after freezing them. But then there was a post from a guy calling himself Neural Network Instructor who laid out a method using Epsom Salts (magnesium sulphate) and plain cold water. Another guy Eddie George backed this up and expanded on the description a bit to make it easier to understand. 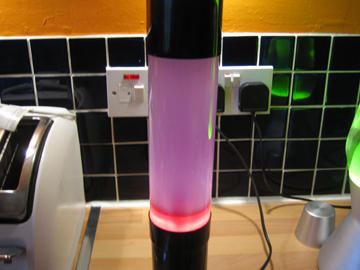 This is the information I took to try on my four lamps and I can tell you - it works!! 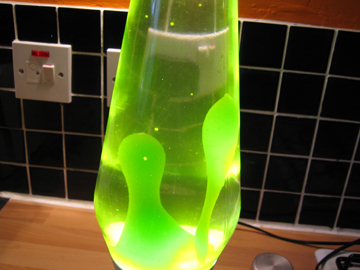 I've put this page together just to show in as much detail as I can how the method works so that everyone can benefit from Neurals and Eddies contribution to the world of lava lamp restoration. Thank you, and now onto the good stuff. Here's my cloudy Astro. Something definately goes on in there when it's switched on but you can't see it. Nope, not a sausage. Make sure that the lamp is cold before going any further. 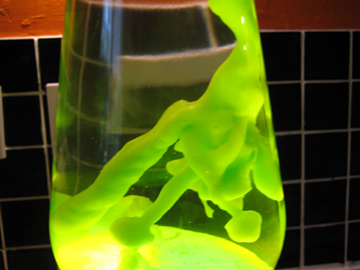 The wax inside must be solid and cold or you will end up pouring it all away or breaking it up into tiny blobs. 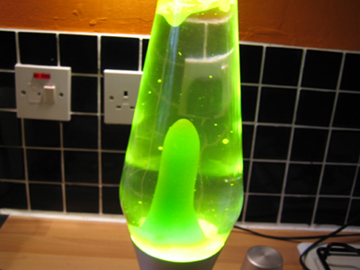 If you've had the lamp on then leave it off for a couple of hours at least before proceeding. First thing to do is remove the lid - this will undoubtedly invalidate your warranty, if you've still got one. The lids seems to be glued or sealed or something and so took a bit of might (and the right tool) to unscrew them. 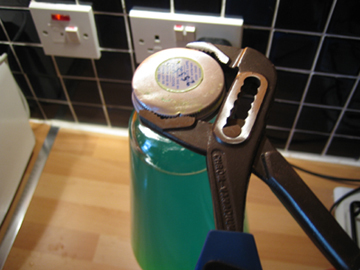 Some lids seem to be more like beer bottle lids and so have no screw threads - that wasn't my experience but many people have reported that to me. As it needs to go back on afterwards all I can suggest is that you take it off carefully in whatever way you can, or find another way of resealing it afterwards. Pour the water away gently. The wax must be solid when you do this. There's a definite paraffin sort of oily smell and some detergent like bubbles in the water. Add some COLD water, gently, down the side so not to hit the wax directly and swill it around gently in order to gather up any remaining bits and pour away. Repeat the gentle swilling until no more bubbles or oily scum is seen. Then you'll be left with just the solid wax in the bottom and a nice clean bottle. 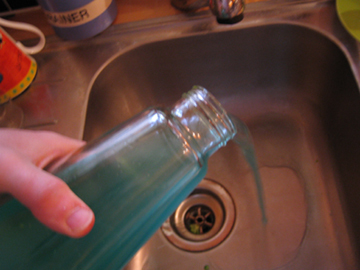 Fill the bottle, gently again - don't pour water directly onto the wax, to just below where the neck tapers - so when you put the silver cap on the water line is above the bottom of the cap. Nice clear water! (well for London anyway). There's bound to be some stuff floating about unless your rinsing was very thorough. The lamp now needs to heat up until the wax is fully melted. 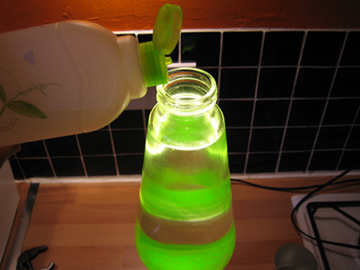 Once the wax has melted and is sitting at the bottom of the bottle not doing anything, add a couple of drops of washing up liquid detergent - only two or three drops though, not a squirt. I used Ecover but I'm sure Fairy or any knd of washing up liquid would do it. Neural called it a "surfactant". 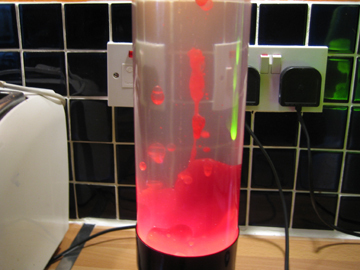 In one of mine the wax has become really bubbly which may be because I put too much in - I don't know really. Meanwhile... Let's get the Epsom Salts made into a solution. Epson Salts are magnesium sulphate crystals commonly used for the relief of constipation. You will find them at the chemist or pharmacy/drug store. Tell them it's for a friend of yours. You only need a small tub - 200g and it'll cost about a pound or so. Get a flat bottomed glass and half fill it with water. 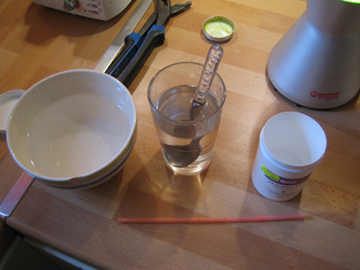 Add a quarter of the tub of salts and stir vigorously until they dissolve. Then keep adding a teaspoon full at a time and stir until they dissolve . When they no longer dissolve, so you still have them floating around after stirring, get a bowl and filled it half full of very hot water and stand your glass in it. This will allow you to dissolve plenty more crystals. I dissolved about three quarters of the tub in half a glass - and you will not need that much. When you get back to the lamp you may find that the wax is behaving strangely and for a minute you might think that you've fixed it already. Neural said that with his lamp the wax just melted flat. Eddie said that he had a bit of a dome going on. 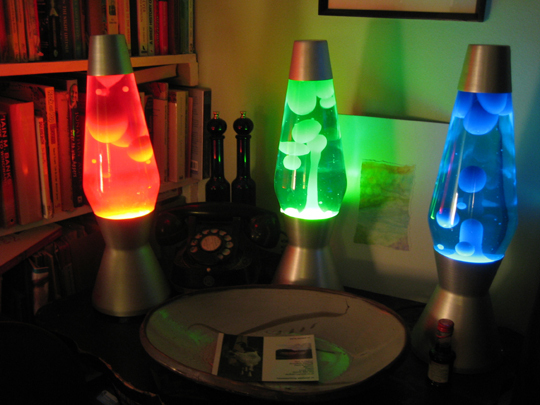 I had a mixture across the four lamps. With this Astro it was a bit lively and kept globbing up but never actually releasing a bubble. This was the sort of action I had when the wax was fully melted. Don't be disappointed if yours is much calmer or does nothing at all - that's what the salt solution is for. The Epsom salts (I think) are used to increase the density of the water which keeps the wax together and makes it lighter in comparison to the liquid (sounds feasible). So let's grab our salt solution and give it a go. Once the wax is fully melted you need to add the salt solution very very gently. It can have quite a dramatic effect on the wax and even break the wax up if you just chuck it in. Dip it in your salt solution about an inch, and put your finger over the top. 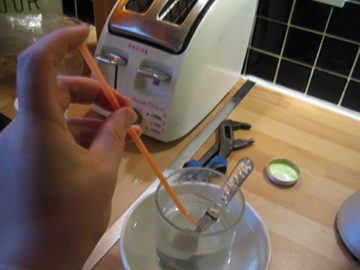 If you keep your finger over the top (as in the picture) the liquid stays in the straw when you take it out - clever. If you have a pipette then use that you posh person you. 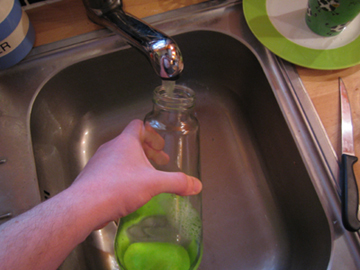 Transfer to the lamp and release your finger to let it drip down the side of the bottle. 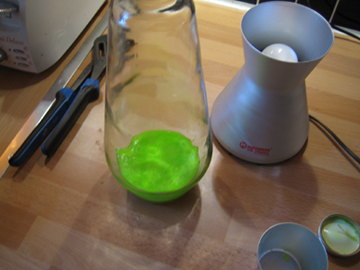 When you add some salt solution the lamp might swirl a bit and start glooping about - however, give it a minute or two and it will settle again - then add some more (gently). What you are trying to achieve is for bubbles to rise all the way to the top before falling again. Often they just go half way or it makes a column. This takes time, lots of time. Here's mine, cloud free, working like a treat! 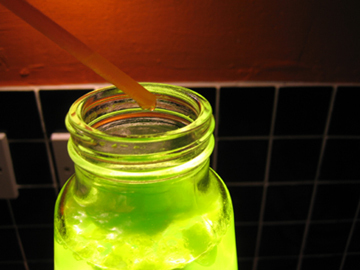 Neural suggests adding some food colouring to colour the water - who has food colouring knocking about these days? It's the sort of thing your mum has decomposing at the back of a cupboard. The Astro was a complete success - the other three were a mixed bag but all positive in that they are better then they were. You shouldn't assume that they will be as good as new - there may be other problems with the wax being very broken up and some are just unrecoverable. 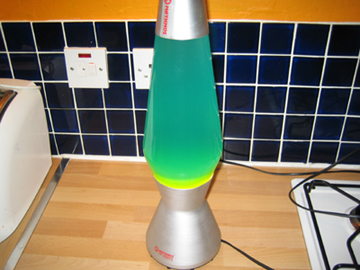 But a cloudy lava lamp is a waste of space, completely useless, so it's got to be worth a try. 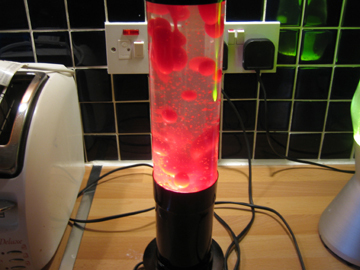 Here's a quite nasty looking red Jet lava lamp as a comparison. Very cloudy this one and completely useless as it was. Looked like the wax was pretty messed up. The fresh water and adding washing up liquid all went without incident. As I added the salt solution it started getting very weird and bubbly. Until it was all a bit out of control. I'm not convinced that this is totally my fault. When it was cloudy I'm sure what you could see of the wax was very much like this so it's probably down to it being shaken or dropped at some time. Still looks pretty funky though. And here's a picture of the other three together. The red one, as seen above, is a bit crazy and has clouded a bit from all the small bits of wax floating around. The orange AstroBaby is fabulous but has bubbles in the wax - cool effect though. The yellow/green Jet was much clearer and looks like a load of psychotic peas bouncing around, but now it's clouded a bit as well so I might have another go, or maybe add some food colouring to give a better contrast. So it does look like some might cloud up again over time. 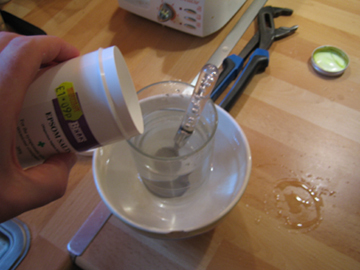 Some people have suggested using distilled water rather than just tap water for better results - might be worth a try. There you go, two complete successes and two "not bads" out of the four. I hope that's been helpful and remember that none of this is my fault - good luck! If you have a different experience or want to share then please drop me a line to robin@moltenmeditation.com. It's the one on the left!